Wayne Rooney has revealed for the first time why he was so unhappy under Alex Ferguson and also just how clumsy Phil Jones can be. The United striker has kept his counsel ever since Ferguson announced to the media on the final game of last season that Rooney wanted to leave the club, but in an interview with The Telegraph has said he is happy again with his football now that he is playing up front. It was no secret that the former Everton man was not pleased with having to constantly play second role to Robin Van Persie in midfield, but not only is he content at Old Trafford, he is looking to extend his stay. 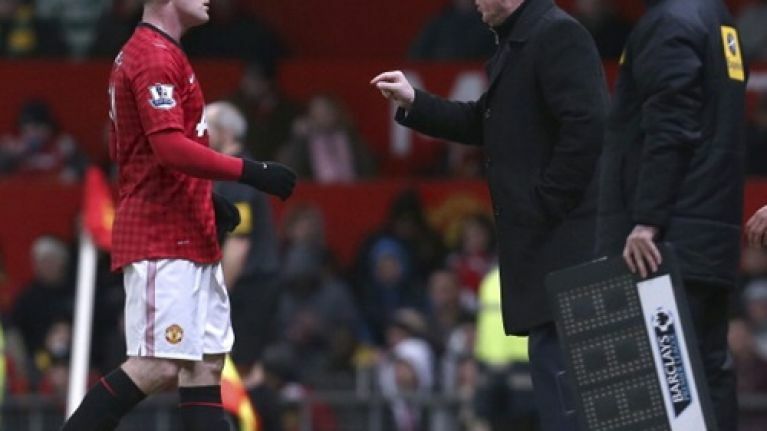 Rooney added that he was “disappointed” to be asked to play in midfield so often and said he had to be selfish – by asking to leave – for the sake of his career and claims he feels rejuvenated under Moyes as well as being fitter than at any stage during his career. Rooney also said that his days of wearing the headband to cover his scar after an accidental kick from Phil Jones in training are nearly at an end, but illustrated that the former Blackburn man can be a little on the clumsy side in training and borderline reckless as he wasn’t even stooping to header the ball when he took the impact. “It was an accident. Phil Jones was being a bit clumsy. The ball bounced up to my head and I went to knock it off and he basically karate-kicked me in the head,” he revealed. A happy Rooney could spell trouble for opposing defences, a timely boost for United after an underwhelming start to the Premier League campaign. Wayne Rooney 'arrested on public intoxication and swearing charges' in Washington D.C.